With all of the different varieties of eggs on the market today, it can be difficult just to decide which dozen to buy at the grocery store. Decode the egg jargon with the definitions below relating to egg variety, grade, composition, and cooking. Air Cell – A pocket of air located in the large end of the egg, between the membrane and shell. As an egg ages, the air cell becomes larger. Albumin – The protein-rich egg white surrounding the yolk. The albumin is a translucent liquid until heated or beaten, at which point it solidifies and turns white. This solidifying action is used to thicken or set custards, casseroles, and other dishes. Blood Spots – These harmless inclusions are caused by a blood vessel rupturing on the surface of the yolk during formation. Most eggs with blood spots are detected and removed before sale. Blood spots are not an indication of a fertilized egg. Cage-Free – Eggs laid by hens that are not kept in cages. Cage-free hens are usually kept indoors in a hen house or other large facility but are allowed to roam freely and have free access to food and water. Chalazae – The white, rope-like strand found in a raw egg white. The chalazae serve to stabilize the yolk in the eggs. Chalazae are more prominent in fresh eggs than older eggs. Free-Range – Free-range hens are raised outdoors without the use of cages. The hens are allowed to forage for insects and other food in addition to any feed given to them. Grade – The USDA’s system of classifying eggs based on their interior and exterior quality at the time of packing. Under the USDA system, eggs may be graded AA, A, or B. The size and nutritional value are not evaluated when determining the grade of the egg. Most eggs sold in grocery stores are grade AA or A. Grade B eggs, which may have small cosmetic defects are usually used to make commercial products. Lecithin – A natural emulsifier found in egg yolks that allow oil and water to combine. This emulsifying property makes egg yolks a key ingredient in sauces and dressing like mayonnaise and hollandaise sauce. Organic Eggs – Eggs produced by hens that are raised without the use of hormones and given food produced without the use of pesticides, herbicides, and other chemicals. To bear the USDA certified organic seal, the eggs, and their production methods must meet USDA organic standards. Pasteurized – eggs that have been heated in-shell to destroy potentially harmful bacteria such as salmonella. Pasteurization allows raw eggs to be used safely as an ingredient in recipes. Shell – The outer structure of an egg that is composed of mostly calcium carbonate as well as trace amounts of other minerals. An egg's shell is covered in thousands of pores that permit the exchange of gasses and moisture. 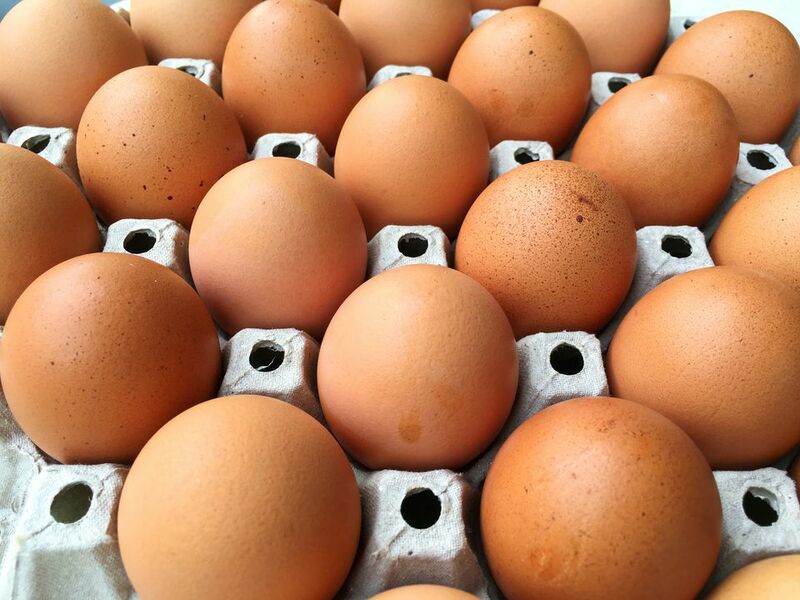 Commercial eggs are usually coated with mineral oil to prolong freshness. The color of an egg's shell is determined by the breed of hen. Size – The size of an egg is dependent on the size, breed, age, and living conditions of the hen. The size of commercial eggs includes small, medium, large, extra large, and jumbo. One jumbo egg is roughly 1/4 cup in volume. Vegetarian Eggs – Eggs from hens that are fed an all vegetarian diet. Yolk – The yellow portion of the egg which consumes about 1/3 of the total egg volume. The egg yolk contains fat and protein and is a rich source of many vitamins and minerals.